Tesla Motors have announced a new extended-range upgrade for the Roadster — the Lotus-based two-door that preceded the Model S sedan. The upgrade includes a battery swap, a retrofit aerodynamics kit to reduce drag by 15% plus new tires and wheel bearings to decrease rolling resistance by 20%. The upgrades are expected to yield a 40 to 50 percent improvement in range, breaking the 400-mile mark. Battery technology has continued a steady improvement in recent years, as has Tesla's experience in optimizing total vehicle efficiency through Model S development. Tesla have long been excited to apply this learning back to their first vehicle, and aim to do just that with the prototype Roadster 3.0 package. It consists of three main improvement areas. 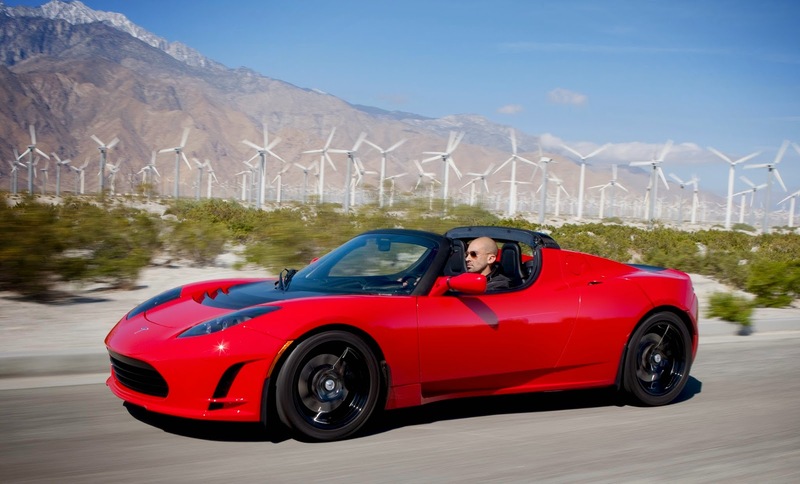 The original Roadster battery was the very first lithium ion battery put into production in any vehicle. It was state of the art in 2008, but cell technology has improved substantially since then. Tesla have identified a new cell that has 31% more energy than the original Roadster cell. Using this new cell they have created a battery pack that delivers roughly 70 kWh in the same package as the original battery. The original Roadster had a drag coefficient (Cd) of 0.36. Using modern computational methods Tesla engineers 'expect' to make a 15% improvement, dropping the total Cd down to 0.31 with a retrofit aero kit. The original Roadster tires have a rolling resistance coefficient (Crr) of 11.0 kg/ton. New tires for the Roadster 3.0 have a Crr of roughly 8.9 kg/ton, about a 20% improvement. They are also making improvements in the wheel bearings and residual brake drag that further reduce overall rolling resistance of the car. Combining all of these improvements Tesla 'expect to achieve a predicted 40-50% improvement on range between the original Roadster and Roadster 3.0. There is a set of speeds and driving conditions where we can confidently drive the Roadster 3.0 over 400 miles (640 km). Tesla will be demonstrating this in the real world during a non-stop drive from San Francisco to Los Angeles in the early weeks of 2015. Appointments for upgrading Roadsters will be taken this spring once the new battery pack finishes safety validation. Tesla are confident that this will not be the last update the Roadster will receive in the many years to come.